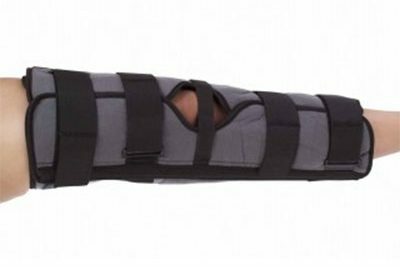 Due to the damage to the medial structures and articular cartilage, it is advisable to immobilise the knee in a knee extension (Zimmer) splint to keep those structures in a shortened / less compressed position until they have healed adequately. The author has found that this usually occurs in about 2 weeks (judged by pain reduction and absence of positive apprehension testing), but may take longer in some individuals. There has been little research into the optimal period of immobilisation. Recurrent (3 or more) dislocations should be referred for Orthopaedic review. Surgical management consists of relatively drastic measures, such as removing the tibial tubercle and reattaching it more medially (to provide more mechanical support as the line of pull of quadriceps will naturally want to pull the patella superiorly and slightly laterally; patients with a greater Q angle are therefore more susceptible to dislocation, and medial translation of the tibial tubercle will reduce the Q angle) or reconstructing the medial patellofemoral ligament (often using the hamstrings looped through a corner made in the medial corner of the patella). Conservative management should, therefore, be thoroughly exhausted before operative management considered.